Estcourt may be said to bear, at least in its origins, some comparison with the ancient city of Rome, for it began at a fort or drift where a modest inn and Trading Store was set up by the first inhabitant Clem Heeley, in 1847. It grew back into the shadows of its “Seven Hills”, situated in the midlands of the area previously known as Natal, it prospered on the trade between north and south and grew to be a flourishing “half way house” for the travelers, soldiers and statesmen going to their destiny long the inland main road. It became an outpost of frontier defence, against their counterparts, the Bushman (whose threat was portrayed in the towns original Coat-of arms and its legend “Self Reliant”) and whose depredations led to the posting of a detachment of the 45th Regiment, which moved in December 1847 into the “Ordinance reserve” in the bend of the river at the Alice Bridge. Then, secondly following the Langalibalele Rebellion, 1873 of the Hlubis, and the Natal Government’s realisation of the growing Zulu danger under Cetshwayo, came the construction in 1875 of Fort Durnford, a fine example of the military engineering of the day, standing high above the town on the hillock on the southern outskirts, just above the Alice Bridge. Being the largest commercial and service center in the Midlands region, uMtshezi is important for the inhabitants of nearby Mooi River, Winterton, Bergville, Colenso and Weenen. These two areas linked-up with Weenen to become known as uMtshezi which is administered by a combined Council consisting of 14 Councillors. This area is also the heart of the large surrounding agricultural area. Beyond the usual infrastructure like water, electricity, roads and sewerage, Estcourt has engineering works, which are able to undertake all types of general engineering on a large scale. The saving to a potential industry is considerable in that the need to establish their own machine shop is avoided. Estcourt can handle most things that anyone would require. 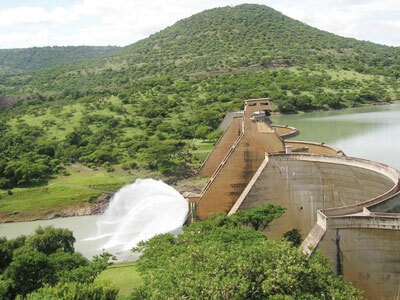 Estcourt has an abundance of water from the Wagendrift dam, which was opened on the 14th March 1964. The dam is unique in that it’s the first of its kind actually constructed in the world. Estcourt/Wembezi serves a vast area including the Ntabamhlope – Giants Castle area and the Loskop townships. It is estimated that approximately 130 000 people are living in these surrounding areas. The main commercial sector is in Estcourt and is well established with more than 600 businesses. The town of Estcourt has become the home of some of the well-established industries in the country, namely, Eskort Bacon Factory, Nestle, Masonite, Narrowtex, Clover, Bunjy Toys, Glamosa Glass. These progressive manufacturing industries serve both the South African market as well as being significant exporters in the industry. Estcourt is ideally situated with easy access to various towns, which also make up the well known tourist attractions, namely the Drakensberg Region, The Midlands Meander, Ladysmith, Weenen, Colenso which also form part of the world renowned Berg, Bush and Battlefields Route. The new Drakensberg Route which was recently launched, incorporates the uMtshezi area. It is believed that the town of Estcourt was named after Thomas Henry Sotheron Estcourt. However, claims that the town was originally named Bushmans River Post or Bushmans River Drift and that the change of name to Estcourt took place in 1863.It can be stated that town was never named either Bushmans River Post or Bushmans River Drift, but simply, Bushmans River. Estcourt is also the start of the Kwa-Zulu Natal Battlefields Route and played an important role During the South African war of 1899. Estcourt previously comprised of a population of approximately 3 407 whites, 710 coloureds, 5 432 asians and 1 296 blacks as per the census taken in 1991. The latest population estimation as of 2008 is 68314 persons are residing in Umtshezi municipality. The population of nearby Wembezi is approxiametly 25 000. It is estimated that the area immediately surrounding Estcourt/Wembezi is home to approxiametly a quarter million people, mostly living in the rural environment. There are also other black homelands in the vicinity of Estcourt from which the town draws a great deal of its labour.